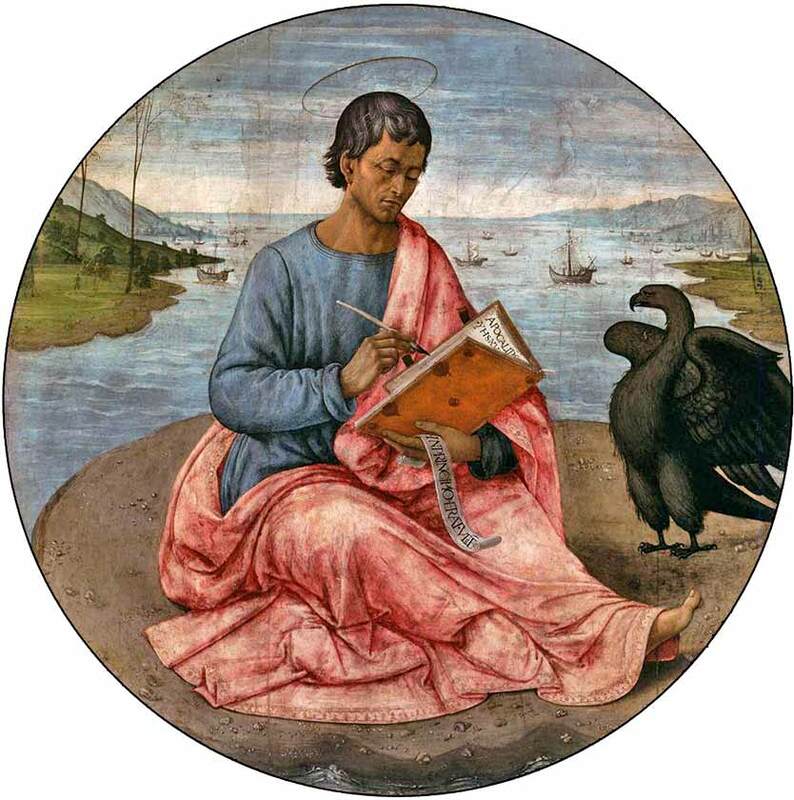 St. John the Evangelist by Domenico Ghirlandaio, ca. 1480. 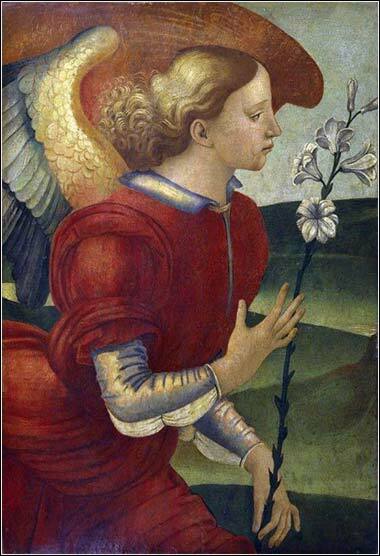 The Archangel Gabriel by Luca Signorelli, ca. 1480. We are quite persuaded that the very best way for you to be spending your leisure time, is to be either reading or praying. You may get much instruction from books which afterwards you may use as a true weapon in your Lord and Master’s service. Paul cries, “Bring the books” — join in the cry. Go therefore and make disciples of all nations . . . teaching them to observe all that I have commanded you. If we cannot cite to Scripture, we are poorly equipped to join God's army. The Great Commission, to teach and make disciples of all “nations” — which is to say, all people — cannot be accomplished without God's Word. In the first quotation, Paul tells us that Scripture makes the man of God complete, equipped for every good work. Here, the word “man” should be read in the sense of “messenger”, for it is in our commissioning as Christ's disciples that learning the Bible fulfills its second function. It instructs us, most assuredly; but it also gives us the means to instruct others. Yet how can we do this, if we do not have the Scripture ready in our mind to speak it? It is well and completely good to read something in the Bible and to take the meaning to heart, to conform to it, even if we do not remember precisely where we read it. And truth be told, being able to cite a verse from the Bible verbatim is a tough chore for those of us without photographic memories — and it doesn't improve with age, does it? To help us along, we are going to give a little more emphasis to our Memory Verses. Daily Prayer publishes one every ten days, but it might be helpful to everyone if we emphasized it a bit more. If you are worried about memorizing the Bible, fear not: This will be one sentence every two weeks; if you can feed yourself, you can remember one sentence every two weeks! These are not going to be random Bible verses. Each will be chosen to address a specific issue, and usually one that a lot of people seem to get wrong. They may address sensitive or controversial subjects. I do not know why something that is written in plain and simple language in the Bible should be controversial among Christians. I suppose it should not surprise me. The hospitals are full of people who read boldfaced warnings and immediately ignore them. How many people will take a drug that says “Danger! Do Not Drink Alcohol” and then have a couple of beers? We might drive away some readers who don't like what the Bible says. I have yet to find a church denomination that does not generate doctrine in direct conflict with the Bible. But if someone doesn't like what the Bible says, I expect that they won't like what Daily Prayer says, either. Starting today, we are going to stress our Memory Verses a bit more and integrate them with some commentary. We will extend the reading time to two weeks. On alternate Mondays, we are going to address the meaning and importance of the verse in the Daily Inspiration. We might repeat this the following Monday, or perhaps restate it — we might try several different formats to see which one is the most useful. The goal is to tie together the memorization aspect with the usefulness of the verse in teaching or discussion. Ultimately, we hope to better prepare ourselves to speak or think God's Word, as it pertains to a specific topic, and be able both to quote and to cite a pertinent verse, whether to ourselves or for the benefit of others.